We are based in Pennsylvania and we happily serve PA, NY, NJ, & surrounding areas. Please contact us for laser screed rental quotes with operator. Take a look through our gallery and see what we've done for our customers! We are based in Northeastern Pennsylvania, but happily serve our surrounding states! 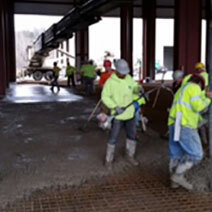 I partnered with Creek Side Concrete on two 60,000SF projects in Pennsylvania. They were contracted for foundations, slab on grade and miscellaneous concrete work and did an excellent job. Jim Fry stays involved during the entire process and his crews are experienced and capable. Most importantly, the work is done right the first time. I will certainly contact Creek Side for the next project in that market. –Dan Croft, Project Manager, Arco Design/Build, Inc. It was a pleasure working with Creek Side Concrete on the recent construction of our 580,000 square foot Camelback Lodge and Aquatopia Indoor Waterpark, the largest waterpark in the northeast! Creek Side played an important role in the concrete slab work for both slabs-on-grade and elevated slab construction. Their pricing was competitive, and their local presence and availability of manpower and equipment was a big benefit to the project. I hope we get to work with them again in the future. Creekside Concrete provided us with footings and flatwork for a 27-unit office-warehouse project, a group of 11 buildings located in the Iron Run Industrial Park in Upper Macungie Township. The job needed to be completed on time and on budget. Creekside Concrete delivered quality workmanship and they delivered it on schedule. Our goal as construction professionals is to associate with able and skilled contractors. We selected Creekside Concrete because of their experience, knowledge and they fit well with others on our construction team. Serving Pennsylvania, New York, New Jersey, and surrounding areas.